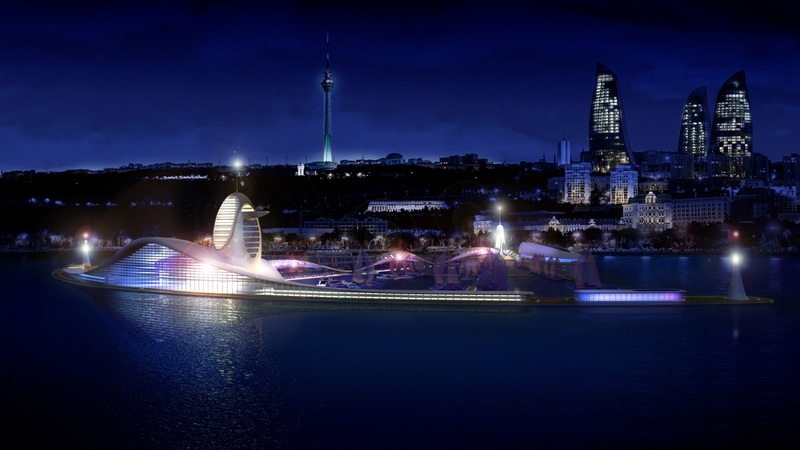 This innovative harbour for pleasure boats is located along the coast of Baku like a mysterious manta-ray that stretches for 500 metres offshore, deploying its large wings over more than 700 metres, while the long, thin tail remains its only connection to the mainland. The manta-ray embodies the absolute lightness of marine forms and the protective maternal instinct of taking care of their young under the large surface area of their body. 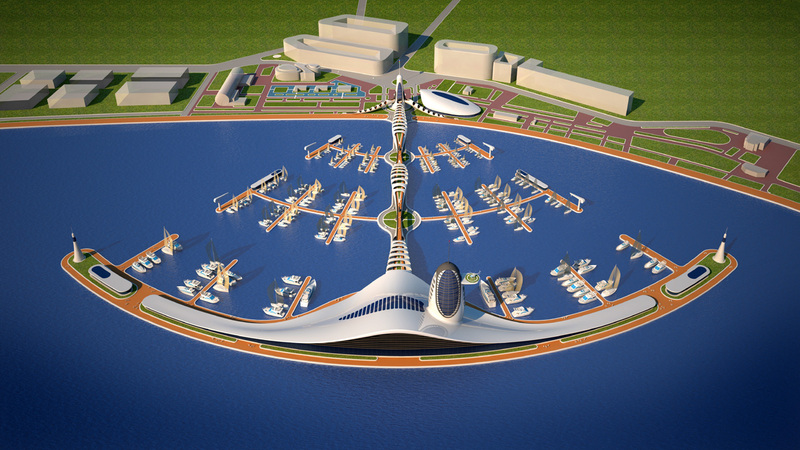 Within this vision, the Italian architect Giancarlo Zema designed a port structure, with yachting club, which is modern and can accommodate over 250 yachts up to 20 m and 50 yachts and super-yachts up to 60 m. Signalling lights are placed at the end of each pontoon. On the mainland, a discreet, yet necessary, urban design imagines the removal of the unpleasant driveway along the coast, in favour of the development of a more suitable connection between the new port and the city’s main street with its square, fountain and national flag. 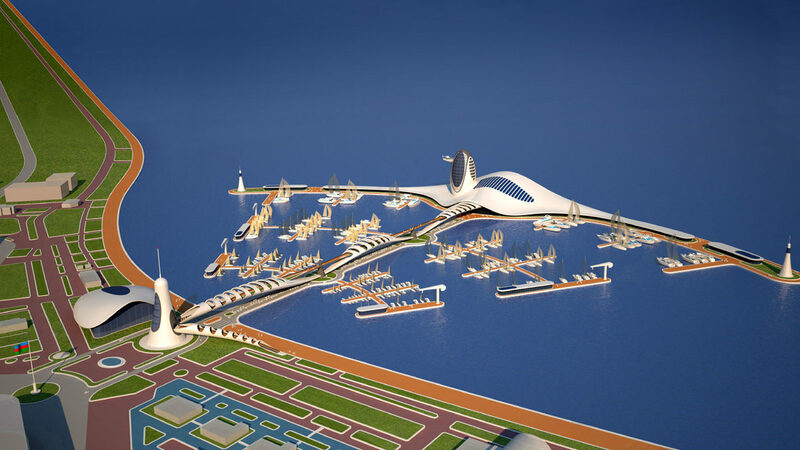 The latter have been moved in order to create space for a futuristic lighthouse-tower, which has panoramic views that become the central point from which the tail of the great Manta and its pedestrian routes can been seen. 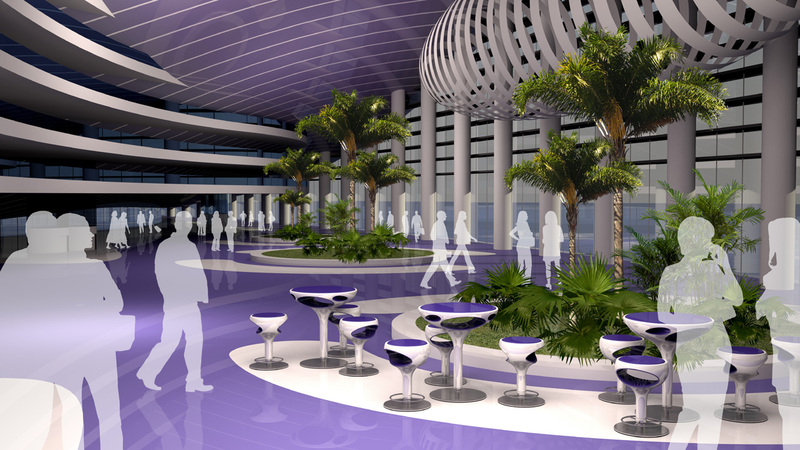 All alongside a modern multi-storey carpark which can accommodate up to 1,000 cars. A fascinating green walkway, suspended 10 m in the air, allows one to enjoy a privileged view of the whole marina. 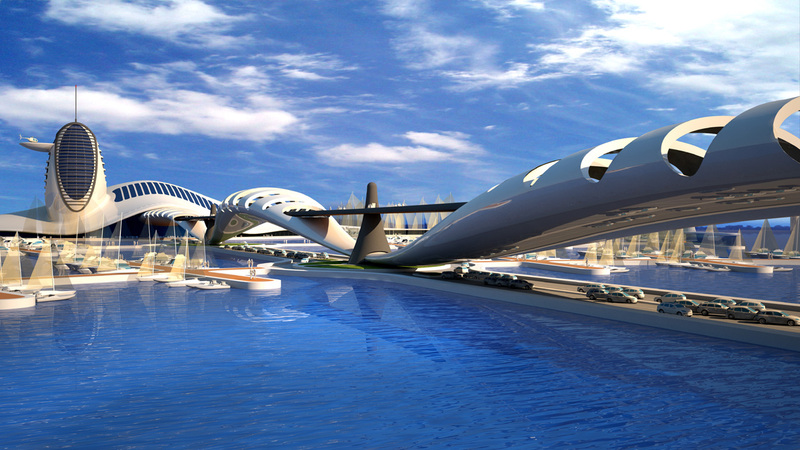 The walkway is shared with the public, providing direct vehicular access to the quays of the port. The tail of the great Manta gives access to the curvy and embracing aluminium coated body of the main structure, which is covered in photo-voltaic panels. 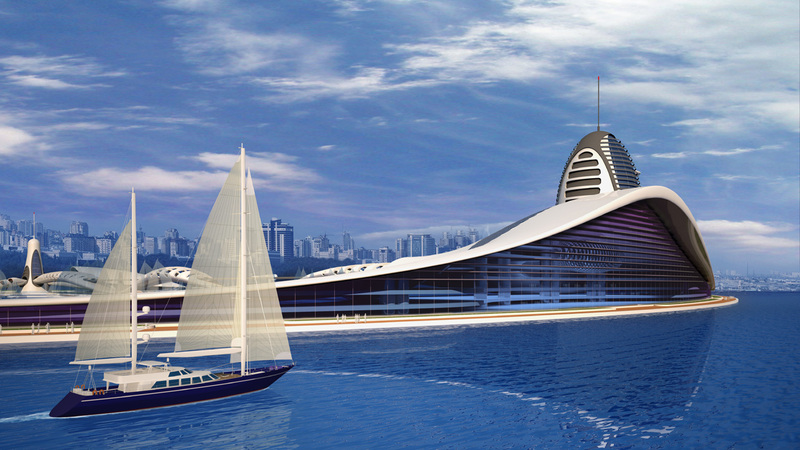 The body encloses; the great entrance hall, the 12,000 sqm yachting club, 6,000 sqm+ commercial areas, 5,000 sqm+ restaurants, restrooms, green areas, helicopter pad and the panoramic hotel, which has 200 ultra-luxurious suites with breathtaking views of the Caspian Sea. 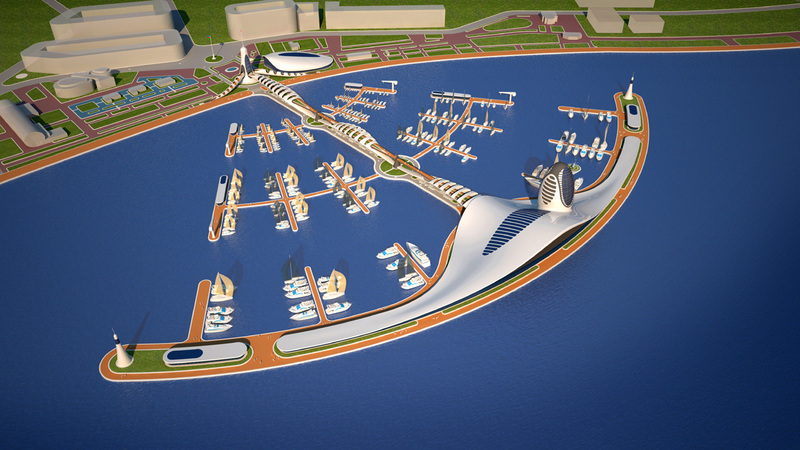 Soon, the Manta Yacht Club & Marina will enrich Baku with a futuristic, innovative and functional port.